Enjoy Plantiva Aller Dx. Plantiva Aller Dx 60 Capsules Dietary Supplement Seasonal Relief Restores Nasal Airflow Clinically Tested Defends Against Environmental Sensitivities Allerdx Is A Clinically-Tested Blend Of Herbal Ingredients Created By Doctors To Help Control And Moderate The Body's Reaction To Seasonal Environmental Stresses. Allerdx Is Designed To Help Regulate The Immune System As Well As Reduce Sensitivity To Conditions In Your Environment. 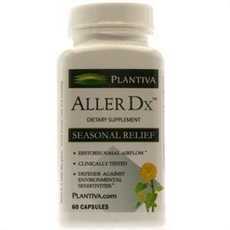 Allerdx Addresses Both The Cause And The Symptoms Of Seasonal Challenges Without Drowsiness. (Note: Description is informational only. Please refer to ingredients label on product prior to use and address any health questions to your Health Professional prior to use.